It has been a while since I’ve written on this blog, but in that time I have been getting to know Google Adwords a lot better. I have put together some details of my experience that will hopefully prepare you for the world of online marketing. As I mentioned in “Sell Yourself” and “Wordplay” eMarketing and online advertising has a lot of benefits which advertising on print media does not. For instance, you can choose to only pay for the number of adverts that interested users have clicked on and not an estimated target audience. As Google is a very useful tool, and a well known search engine, I decided to use their service which uses keywords adverting. I firstly participated in the Google Online Marketing Challenge (GOMC) which is a worldwide student competition to see which students use and optimise online marketing the best. The second instance was marketing Cue, the National Arts Festival newspaper. The GOMC was my first hands on experience with Google Adwords. There is an immense amount of documentation such as handbooks and manuals to enable you to start out with Adwords. After reading these manuals, the GOMC team was confident in getting started, however, the practical work was not as easy as explained and instructed. The team was unsure of each column in the grid especially when it came to whether or not it was a Cost per Click (CPC) or a bid on buying the actual keyword. The team had also looked at a certain company that we had thought was very marketable. Unfortunately the company had upgraded their site and changed their domain as well as their Information and Technology assistant, so we were unable to gain access to the analytics of their site. We were then unsure of the effect of adwords on the company and its marketing. This also made it was also difficult to know whether not the keywords used were effective. Although adwords does tell you which keyword has the most amount of conversions, it also beneficial to gauge from the analytics of the site whether or not the type of marketing done has been beneficial or effective. Although this experience did not go well it was an enriching experience and prepared me for my second online marketing experience. The second experience with Google Adwords was a lot more effective and productive. Having learnt from my previous experience, I ensured that I first and foremost had access to CueOnline’s analytics. Marketing CueOnline was also easier in terms of marketing it as I knew the product very well. Having worked there I knew what the company was trying to achieve and what the appealing and strong points of the company and its products were. This made creating and buying keywords easier to find and buy as I knew which aspects to focus on. The first time the team had difficulty navigating the site, but the second time I found an option on the right hand tool bar for a “New Interface (Beta)”. Clicking on this option changed the interface to a one that was easier to navigate. This had graphs with a better explanation to help you achieve gage how well each campaign and every keyword is competing. This interface also allows the client to know how much they have spent each day with every click and conversion, depending on the pricing model chosen. The Cue team also used other online networking and social media sites such as Facebook and Twitter for site optimisation which definitely worked. The adwords had to be checked very regularly and maintained. Maintaining the campaign means that bids for certain keywords were made higher if it was thought to be more beneficial. In some cases badly performing keywords were deleted in order for it to to give other keywords a chance and not divide the budget further with irrelevant words. Sometime additional campaigns or adgroups were set up in areas we believed needed it. This in the end proved useful as more impressions were converted to actual clicks, which effectively was what the company had wanted. The ROI or Return on Investment was that we were able to double viewers for the site in comparison to last year. If at first you don’t succeed, keep trying. Google Adwords takes a lot of “playing around” and experimenting with before it becomes a success and even then it needs still needs maintaining. See the last post to know how to get started. 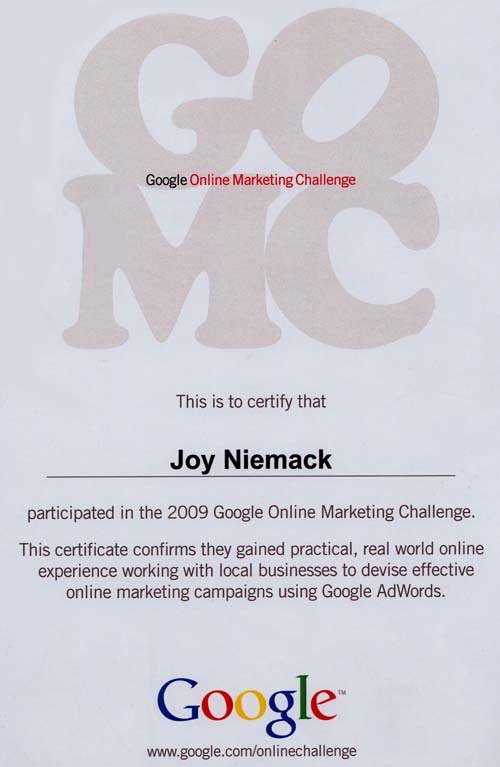 My certificate for the Google Online Marketing Challenge.